Ladies, Start Your Sewing Machines! There are so many things that I WISH, WISH, WISH people had told me much sooner than I figured out on my own. 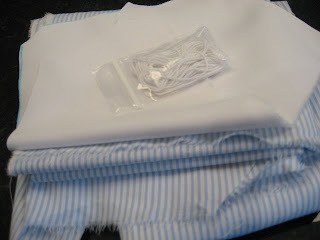 Here’s something I did this morning that I would love to share with any of you who sew (particularly for little girls). I’m sure many of y’all have figured out that I am one of the cheapest persons on the planet (my mom may come in first, sorry mom!). However, I do enjoy nice things… so what do you do when you like the niceties in life but can’t AFFORD them… you make them! When Erika and I went to our grandfather’s funeral last year we stopped at Sikes & Kohn’s. If you’ve ever been to the beach (north FL) from B’ham or further north you’ve passed it between Montgomery & Troy… it’s the giant shoe store. The store is easy to miss; the shoe billboards are not. 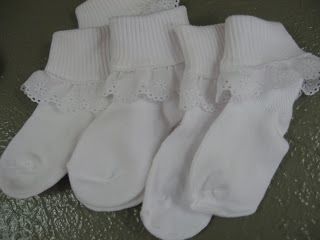 Anyway, I bought Morgan 3 pairs of precious eyelet ruffled socks for $6 a pair. I know, it’s crazy to spend that on socks but they were super cute and I loved them (& we’ve managed to keep up with them). Well, this week I went to Target and bought these…. For the price of 1 pair of socks, I made 3 pairs (earlier today I said 6… I got confused) and probably could have done more had I bought more eyelet. 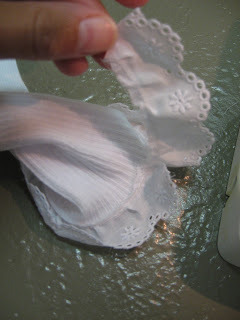 I bought the ruffled eyelet trim at Walmart for $1.32 a yard. I would estimate that 3 yards of eyelet trim would do 6 pairs of socks. First, starting at the back of the sock zig-zag the eyelet around the top of the sock. 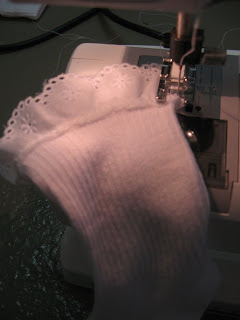 The eyelet will slightly overlap the sock on top. 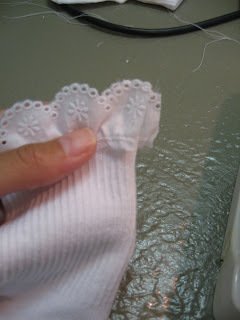 Slightly stretch the top of the sock as you attach the eyelet, this will allow enough “give” to get them on comfortably. Here’s a picture for the visual learners out there. Before you go ALL the way around stop just short of reaching the point where to started. 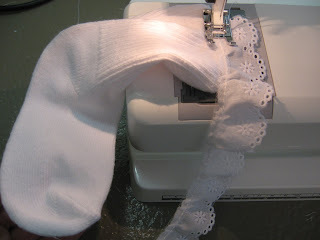 Remove the sock and cut off the excess trim. 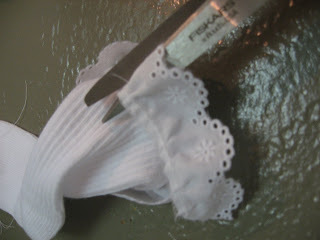 Then you will do a “tighter” zig-zag to bind the ends of the eyelet together. It will not look beautiful or “finished” but because you turn them down the other side looks finished. 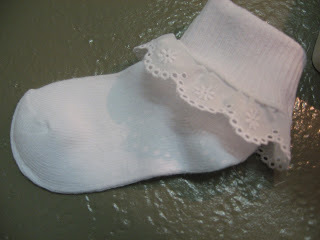 Trim away your strings and turn down the sock… voila, a cute little sock for a fraction of one just like it! Can you make me a couple pair of those socks? they’d look great with my Pumas… Merrells… converse… and Nikes. They might get caught up in my bike chain, but fashion over function right? that is so sweet. I just starting my sewing ventures and have not quite conquered a sun dress. But I am sure i could figure out these socks. thanks for the step by step instructions. Wow!! You really amaze me!! I’m so impressed that you made the socks – don’t they sell those at T.J.’s? I wish you would teach a sewing class. I’d be the first to sign up. Oh- and i made the banana bars this afternoon. haven’t tried one yet, but the batter was delicious!! You AMAZE me!!!! Need I say more…. 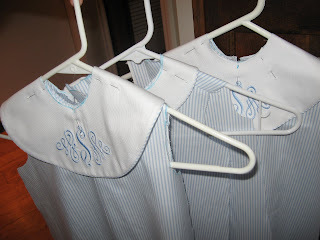 So cute…your tutorial actually made me think I might be able to make some…I’d sign up for your sewing class too-wish we were close enough for them!! Darby, I love the socks and thanks for writing out how you made them. One day when I get my sowing machine to VT I’m going to make some. I love the pictures of your house, it is SO pretty. I wish I could see it in person. I might be visiting my grandmother in Abbeville this summer, so I might just have to come by: )! And, by the way, I am so jealous that your girls went swimming last week…It’s just not fair! We still have lots of snow on the ground, but some is starting to melt…praise the LORD!!! Who knew you were so crafty! 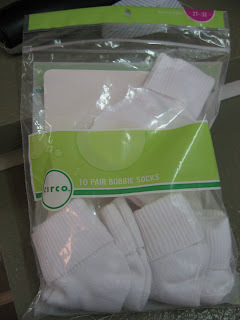 I of course am not and pay for socks – they are very expensive! they look super cute and probably will last longer than the others – AND FYI – they were robbing you – they are only 4bucks a pair at my store! The dressed look REALLY REALLY good! I can’t wait to see pictures of the girls in them! I found your site by googling “hairbow tutorials”, but it looks like you’ve got all kinds of great ideas that I’m going to copy. Thanks for sharing your money saving tips. I’ve already got some boring white socks and will experiment with adding on some trims. I never thought of it before! Definitely was inspired by this! 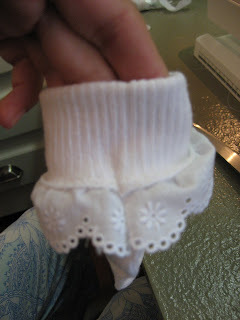 Made some eyelet socks and also found some stretchy pink checked ribbon to sew onto socks. So easy–so fun! Always inspired by your ideas/tutorials/recipes/etc. Thanks for sharing! !